In the amazing world of wedding DIY’s, wedding signs are making a huge statement. Whether it’s for your ceremony backdrop, your dessert table or even you ring bearer, there is a sign out there waiting for you to customize. They don’t take a lot of effort to create, and yet they can add a lot of personality to your big day. Above is a picture of our adorable nephew who walked down the aisle holding this sign around his neck! It was such a cute moment when he entered the church before me and gave Wade a thumbs up! The easiest way to incorporate a sign on your big day is with a chalk board! I made a couple out of thick craft boards and chalk paint and used them for pictures, at our showers, during the reception and even after the wedding for parties and décor. Below is an example of a sign I used at my bridal shower, counting down the days before the wedding! 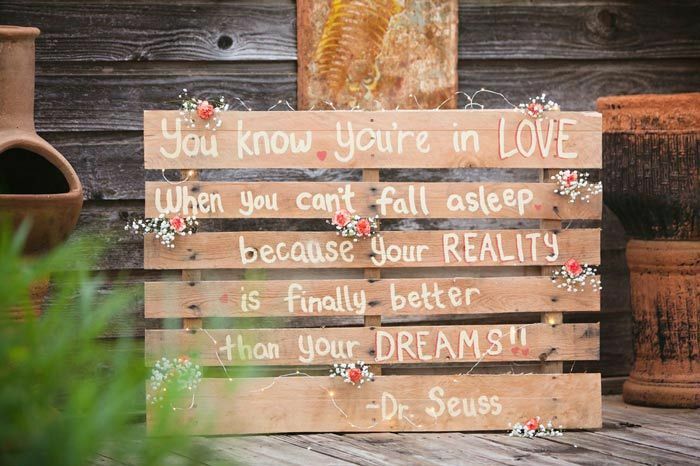 Below is a selection of wedding signs that I truly adore! I hope today’s post inspires you to create your own signs and add your personal touches to them! Bride-to-be’s – what are some signs you plan on creating for you big day? Let me know in the comment section! Thanks for reading!